Reflections and Ruminations: When it comes to matters of faith, seeing may not be believing. When it comes to matters of faith, seeing may not be believing. As a pastor of souls, I am very concerned about what influences and affects the minds and hearts of the people. After all, each one of us has our opinions and thoughts often shaped and influenced by what we are exposed to, whether passively or in a deliberate way. Sometimes, it is what is being shown to us in a passive way that sends subliminal messages to our sub-conscious, and this easily ends up being a huge influencer of our thoughts and beliefs. This thought occurred to me at the strangest of times – from a few moments that I paid attention to a soccer match a couple of nights ago when Liverpool was playing Manchester United in the English Premier League. It wasn’t the match per se, though the outcome was a goalless one and rather lackluster. 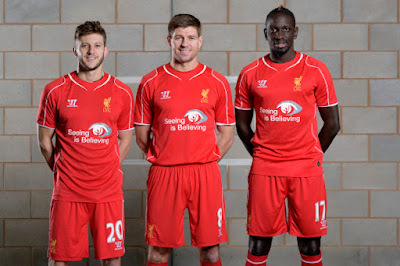 Rather, it was what I saw emblazoned across the front of the jerseys that were worn by the home team of Anfield stadium. The words were “Seeing is believing”. When I saw that, my inner theologian became rather disturbed, and there was a legitimate reason for this. It is no secret that millions of dollars are earned and spent by advertisers of products at such sporting events. This is because the viewership is immense. Singapore is half the world away from the Anfield Stadium. Yet, we got to watch what went on, ‘live’. This also means that millions the world over get to set their eyes on the ongoings of the match, and this includes the many advertising images that flash on the moving billboards as well as what is printed on the soccer players’ football jerseys. I believe that lives are influenced by what is presented, even in a subliminal way. This message that “seeing is believing” is not new. It is also something that many atheists have brandished in the face of religion. However, this message has a toxicity that mitigates against true belief. In our pursuit and practice of our faith, seeing is not believing. In fact, just on the level of language and logic, seeing doesn’t invite nor elicit belief. If you see something, it becomes a fact. Facts do not need belief. For instance, witnessing a chick emerge from an incubated egg does not require one to activate any degree of belief that chickens come from eggs. But when it comes to matters of faith, sight does not necessarily result in belief. 100 years ago, in Fatima, Portugal, a miracle happened in front of an estimated 100,000 people. The sun reportedly ‘danced’ in the sky, something that was promised by Our Lady to the three shepherd children she appeared to. However, even when seeing such a miracle take place, there were still people who did not become believers. If faith is dependent and contingent on seeing, doesn’t necessarily go deep. It could stop one from another necessary aspect of faith, which is to instill wonder and being in awe. It can also stop one from developing faith, fostering it to grow, simply because one is satisfied and no longer thirsty and longing. Did not Jesus himself say to Thomas after the resurrection, “Thomas, because you have seen me, you have believed. Blessed are those who have not seen and yet believe.” This must be greatly encouraging for the great majority of us simply because we are people who have not seen. I was wondering what product was sponsoring this “Seeing is believing” slogan that was being shown to the world for 90 minutes on the chest of those Liverpool players. I thought it would be some corporate giant with a huge budget for advertising. I was wrong. It turned out to be Liverpool’s support of “World Sight Day”, which was observed just 4 days before the match. “World Sight Day” apparently raises awareness for partial blindness, which affects around 285 million people worldwide. While I must admit that the intention to alleviate the plight of preventable blindness is indeed noble, but as a theologian and priest, I also do hold the strong opinion that seeing cannot be equated to belief. Case in point – remember how much controversy was stirred over the social media when a dress was shown and the question asked what colour it was? Some saw it as gold and black, while others saw it as gold and white. Did people see it? Yes. Did they agree to what they saw? Obviously not. Seeing itself may not lead to the reality. Apparently, now the world is going to be set into another tizzy over the colour of a pair of shoes. Wonders never cease. When it comes to faith, which should be the ground of our being, seeing is not believing. We need to be clear that belief is not seeing.